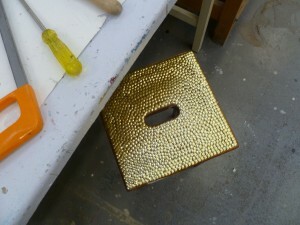 Quite simply, I had the idea of covering a found object almost entirely with ‘off-the-shelf’ brass drawing pins. More pertinently, I was curious to see if this exercise might result in the creation of an object of heightened value – perceived or otherwise – through an almost alchemical combination of two ‘unloved’ products. The pins are archetypal, cheap, mass-produced, office stationary bought from WHSmiths. Many people don’t give them a second thought. Each one almost identical to the last. 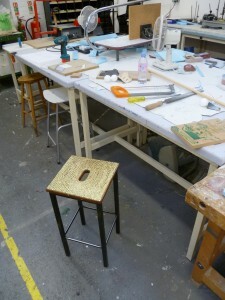 Similarly, the stool is fairly typical to a design school workshop. Practical, and often used, yet unconsidered …and rightly so. It’s a functionalist stool for goodness sake! The wooden seat was separate from its legs when I found it, the securing bolts long lost. I spent around eight hours (over several evenings and DVDs) hammering approximately 875 drawing pins into the stool seat, starting from the inside working outwards. Some new bolts to secure the legs and it’s done. – The pin heads sparkle with an attractive bright yellow lustre. 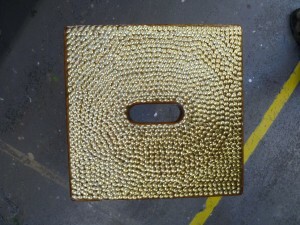 – The close placement of the pins means that at first sight, they are read as one shimmering surface piece. Only on close inspection does one notice the individual pin heads and the surprising origin of the ‘gold’ material is revealed. – The texture of the hammer-beaten brass pin heads is smooth and sensuous to touch and was said to resemble ‘scales’ as on a fish or lizard. Many people run their hand over it, though few people sit. – Again, the hammer-beating process has marked, dented & warped the pin heads so that they take on a softer more hand-crafted quality, belying their mass produced origin. The pin heads bend to the subtle curves of the wood at the edges and the central handle detail. – The surface is cool to the touch, which may be pleasing to the hands but not so much when first sitting! – I cannot say if the pins have weakened the wooden stool seat. I doubt it. No visible sign of damage. Each pin shaft was driven fully to a depth of approx 8mm deep. The wooden seat is approx 25mm thick. I re-planted the adorned stool in the Product Design workshop without announcement or initial acknowledgement. In the spirit of the ‘Random Acts…’ movement which seems to be fairly prevalent in alternative culture, the unexplained arrival and curious origins of the object are hoped (by the originator) to delight and inspire or at least give cause for discussion. I cannot say if there has been any significant recognition of the stool. It remains in the workshop, though has migrated to a less-busy corner and I guess it is largely unused. I can well imagine, for everyday usage, students would feel disinclined to use the brass-pin stool. Is this because of negative association or out of respect for an object which has clearly been subject to almost obsessive adornment and labour? The stool is certainly being ‘considered’ more but the notion of value has been perverted. It is no longer as valuable as a practical stool but may be considered by some as having more artistic and craftsman-like qualities an value of intrigue.